*Please visit the updated version of this recipe here: Perfect Every Time Cut-Out Cookies. Winos and Foodies is sponsoring A Taste of Yellow event to benefit LiveSTRONG. Those yellow bracelets....that's it. I first heard about the event through Tartelette, one of my favorite blogs ever. I just love this idea of raising awareness of the foundation and paying tribute to a loved one with food! Cancer, bleeeeccch!...I HATE that word...hate it more than any other, I think. If I see it in an article, on TV, on the radio...the magazine is shut, channel changed, radio turned off. My plan from now on is, when I hear the word cancer, immediately think, "Livestrong." One of my favorite pictures of my mom! These cookies are a tribute to my mom who we lost to cancer eight years ago. They were her favorite flower and yellow her favorite color, so I think this event would have been right up her alley. This is honestly the first time I've cried making cookies. If I let myself go, I'll have a page and a half blog post, so I'll just say, I had a good mom. She was a redhead, drank beer, made homemade cinnamon rolls and really loved life. She and my dad were married 32 years. My mom wasn't ready to leave us, but when I find a random penny or a cardinal flies across my path, I know she hasn't really. 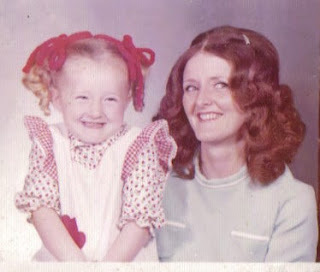 My mom & I in all of our 1970's glory! So, these roses are for Gayle (mom), for my friend Laura who has been battling brain cancer for NINE years now, for Kelly, for big Jack, for my Uncle Ben, for my papa who used to call me "ol' yellow hair" when I was a kid (and would now have to call me "ol' reddish-brown-with-highlights-and-a-few-sprigs-of-gray" hair), for Raquel, and for Kenny who I didn't know, but so many people I love miss him, so I know he must have been incredible. 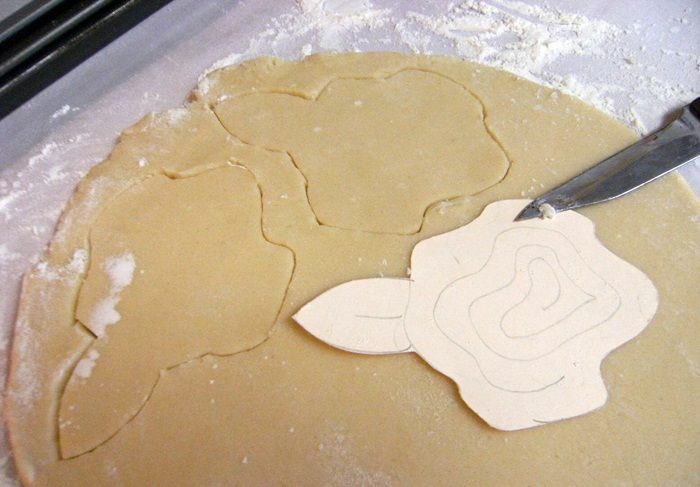 Roll on a floured surface to about 1/4" to 3/8" thick, and cut into shapes. Place on parchment lined baking sheets (I recommend freezing the cut out shape on the baking sheet for 5 minutes before baking) and bake for 10-12 minutes. Let sit a few minutes on the sheet, then transfer to a cooling rack. For the Royal Icing...follow the recipe here for my favorite royal icing. 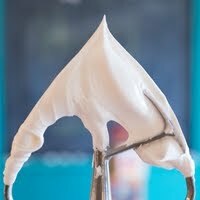 When the icing is beginning to reach a stiff peak, add a drop or two of almond extract and beat until still peaks form. Transfer icing to two separate containers and color (3/4 AmeriColor Egg Yellow, 1/4 AmeriColor Leaf Green). Press plastic wrap down onto the icing. Using a #2 tip, pipe the outline of the rose in yellow. Using a #2 tip, pipe the outline of the leaf in green. Thin both containers of icing with water until they reach the consistency of syrup, cover with a damp dishtowel and let sit several minutes. Stir the yellow icing gently with a rubber spatula to break any bubbles on the surface and transfer to a squeeze bottle. Fill in the rose with the thinned, flood icing. Repeat with the green icing, filling in the leaf. Let dry at least one hour, then using the same #2 tips, pipe the detail on the rose. Let dry completely. I love this, Bridget. Aunt Gayle was such a cool woman. The cookies are beautiful, and so are the pictures and your words. This made me cry, but in a good way - this was just the nicest, most fitting tribute to her and to your relationship with her. I'm sending you hugs from halfway across the country! Great post. Mom would be proud, not only of you, but that all your grammar and puctuation is correct! I'm sitting here crying, too. Thank you for sharing such a wonderful post. The cookies are awesome. So was your mom. And you are right, she's still here.....she always will be. What a wonderful tribute to Gayle... I am proud of you. It was on target and communicated the essence of her. I will always remember her singing the "Yellow Rose of Texas" to me over the telephone when I called her in 1984 telling her we were moving from North Carolina to Texas. She was so excited she sang the whole song. Wow, was that a long time!!! She loved the color yellow and both of you girls wore it frequently. Gayle was cool, unique and special to all of us in many different ways. My memories are numerous. Some of my favorites include Helen Reddy and Mac Davis songs, Pecan Chewies and always giving me encouragement that I could do anything. As the person other than you and Molly who probably has more of her traits (for me most of her not so good traits), I can often hear her voice giving me advice and direction. BTW Molly, she would be checking punctuation and SPELLING!!! Ha! While yellow was the color that you remember, I will always think of the color red when thinking about Gayle, not only because of her hair, but because of her temper--oh yes, she did have a bit of temper ala Jack McKee. She is present when I see red in a cardinal, Crunchy red bag of Cheetos and visions of the infamous "red" pill she was waiting for to cure her cancer. We were lucky to have her for the few years we did. Thanks for reminding all of us of the gift that we received. Uncle Mike...now YOU made ME cry! I'm glad you mentioned "temper" because I remember her asking me where I got my temper and that she "used to" have one, but stopped around age 10. :) HA! She's busted! I don't even think you were born yet! I love the photo of you and your Mum. A very touching post and thank you for sharing it with us. THe cookies are lovely. Thank yo fors upporting LIveSTRONG With A Taste Of Yellow. I've read your post three times. I tend to do that with writings I enjoy. I read Mike's comment a few times too. I'm happy for you. I treasure times when sweet memories creep in and a flood of emotion inspires writing or conversation with others. I think those times are the most sincere tribute and true connection to important people in our lives. P.S. My Mom wanted you to know how much she loved Aunt Gayle. I know she helped us alot when my parents were going through the divorce. Letting me spend summers with you all and she took my mom out to a Chipndales strip show haha! Did you go too Aunt Janice?? I am sure they had fun!! That is SO funny! I remember them going...looking back, that just cracks me up!!! Do you know that the diamond fell out of Mom's wedding ring there?!?!?! Oh yea I do remember that NOW! My Mom always felt so bad about that. Your Mom must have been clapping alot haha! No, I missed the male dancers. We were living in North Carolina. But I do remember (now that it's mentioned:) the story and how Gayle lost her diamond that night. That is really funny. i love those old photos! you are making your mother proud. great flowers! Ok, I missed the post because i was traveling to Houston which was probably a good thing, i don't know if i could have made it through the weekend. we all miss her everyday and it is always difficult when i am with the girls, since they each have so many of their mother's traits. to everyone who commented i know there are other moments that are brought to mind. is crying at work permitted? Bridget this was a great tribute to Gayle, and i am proud of you and Molly for being a blessing to me. Geez, Dad...way to make me cry again!!! I don't even know ANY of you people and I'm crying here at work! All I wanted was a tutorial on how to decorate cookies! I am crying too as I enjoy your post and the comments by family. This comment box is quite blurry!!! Can't wait to try the cookies thank you for the recipe. I am like your dad in the fact that I came to this post late (I have been out of the blog world for a while yet again). But, I wanted to say that Aunt Gayle was the most FUN aunt. When I was a little girl I would get so excited to visit your house because it was always so fun! My favorite recipes are from her. My FAVORITE FAVORITE is Beaumont Dip which on the recipe (from her to my mom photocopied) says "Always a big hit"...which makes me smile every time I make it. I had shrimp for the first time from Aunt Gayle. I love shrimp. One time that I visited Aunt Gayle filled up her big bath with MR. Bubble for me because she knew that it would just make my day to take a bubble bath. It did. 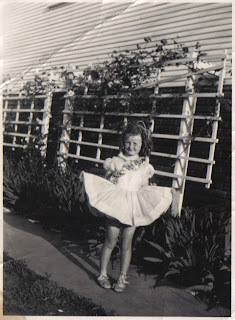 Aunt Gayle always encouraged my girly fun side, which I love! She also came to see me in the musical BRIGADOON my senior year in high school and it meant a lot to me to have her there. Thanks for your post, Bridget. I miss your mom and I hope to carry out her "Always a big hit" way of life. She was always a big hit to me. That dress in the bottom picture ROCKS MY WORLD. I loved this post. I recently lost my dad, not to cancer, but to a disease that was just as bad and lasted as long as if it had been cancer. And I lost my mom a long time ago, but in a totally different manner...murder. I can relate to your story and how you feel. This was an incredible tribute to your mom and, I too, send you hugs. I love your blog and all that you contribute through it. If you still have an extra bracelet, I'd love to have it for lots of reasons but mostly because I CAN RELATE. Thank you for sharing. Ladybug...I am so sorry. I cannot even imagine. Thank you for your comment. YES! I would love to send a bracelet to you. :) Click the link to "email me" as the bottom of my blog and let me know your address. I'm a late one too. I love this post. I think of your mom everytime I put on lipstick or have ice cream for dinner. I loved her too. Hey Erica! That's great! Thanks! What gorgeous cookies, almost to pretty to eat and a wonderful tribute to your beautiful mum, thank you for sharing. Those cookies are so amazing! They remind me of the wild yellow rosebushes that grew in our yard while I was growing up. Beautiful tribute to your mom! What a beautiful post Bridget! I lost my Dad to cancer 6 years ago. Great tribute to your mom. Cookies are awesome. i made these with mint extract for a holiday-ish flavor and they were delicious! your mother was a lovely lady and i know would be very, very proud of such a lovely daughter. What a wonderful tribute, Bridget! I found this after searching for pumpkin cookies. You've made me cry; that's such a lovely post. These were so yummy; I had to stop eating them so I'd have some left to send!! I don't know what I did wrong--my dough was so crumbly. I followed your directions, but couldn't figure it out. Any ideas as to why this happened? I tried this cookie recipe for the first time yesterday, and it was awesome. I love the fact that they're so fast - the dough was easy to roll, even with no chilling time. Love that! They taste quite a bit like shortbread, which is one of my favorites. And they hold their shape beautifully. Next, I'll have to tackle flood icing using your instructions. Hi Bridget, Tested your cookie recipe against two others yesterday. Yours won! Best taste, best shape. I did find that they took way longer than 12 minutes to cook. (it may be my oven; I need an oven thermometer) I am hostessing an Easter cookie decorating party with my sisters, daughter, mom and cousins next Tuesday. My daughter and I are baking LOTS of cookies on Sunday afternoon. Can't wait for the fun! Hi!! I love your blog. There is much creativity and love what you do. But I have a question, because do not live in USA as weighs a stick butter? I tried your recipe this weekend and it is THE BEST EVER!! So easy to make and taste great too, thank you so much for sharing! The cookie recipe? Deelish! My first attempt at flooding? Eeeeck! At least we will enjoy eating the evidence. I was very touched by your story and the posts. I am making these cookies to bring to my mom when she comes home from some oncology surgery this week. Moms are sooo special! i tried out this recipe using lemon zest instead of almond extract and i really liked the results! I used this recipe but i used lemon zest instead of almond extract and really liked the results! I used this cookie recipe today to make my cookies for my cake decorating class...and YUM!!! This has to be the yummiest sugar cookie recipe I have tried!! I'm looking for a crispy sugar cookie and is wondering if your recipe comes out soft or crispy? Just popping by to thank you for sharing this sugar cookie recipe. I've been searching for a recipe that worked for me and this is it! This is going in my recipe box for sure and I plan on using it from here on out. I have tried so many sugar cookie recipes and this one is my favorite by far!! It is delicious! I love the story behind the cookies as well. Thank you for sharing it with us. I just have one question.....both times I have made these cookies the dough has been very crumbly--what am I doing wrong? I have tried refrigerating it before rolling it out, and just rolling it out without putting in the fridge first. I know it's me...not the dough! :) Any suggestions?? Just wanna ask what's the purpose of having baking powder in this recipe? Love your blog and finally decided to try these cookies out. I blogged about my experience: http://acraftyescape.blogspot.com/2010/11/vanilla-sugar-cookies-take-one.html and made sure to link back to you. Do you have any tips on how to make the royal icing look neater? Thanks! That was a lovely tribute to your mom. I just wanted to say thanks for the recipe and all of the icing info, since I just tried my hand at decorating cookies. Bread, no problem, but making cookies and decorating them with icing is a little out of my current comfort zone. However, since the cookies turned out perfectly (after altering for our elevation), I'm certain I'll make more. And play with icing more. Oooh, floodwork! I love the idea how to cut out cookies in different shapes. I never thought of that. 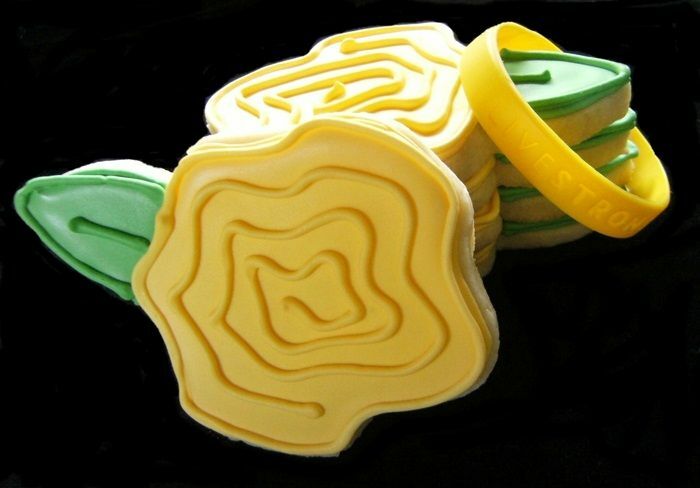 In Europe you hardly kind find nice looking cookie cutters. Thanks for sharing! Loved the tribute to your Mom. Actually I dropped by for the cookie recipe (found you through Pioneer Woman) - and got all emotional over your post. My Mom just passed away on Oct. 4th - cancer as well - and yellow was her favorite color. Your description of your Mom (beer drinking etc.) reminds me of my Mom so much. Being that my name is also Bridget (even spelled the same) - you and I seem to have so much in common. I would LOVE a bracelet if you happen to have one left. Just wanted to thank you for posting this recipe. Lost my Mom on the 27th to cancer. She would have loved these cookies too. The Pioneer Woman linked to this recipe for Sugar cookies and I am midway through them coming out of the oven... they have come out PERFECTLY, are so delicious, so light in sugar (which is perfect for young ones, and even better to account for all the sugar in the icing)... Thank you so much for sharing this wonderful recipe. I just stumbled upon your blog and I love it. What a wonderful tribute to your mother and by the way - the 70's picture is priceless! 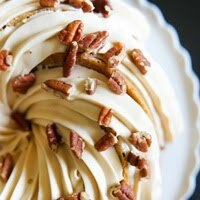 I just found your blog thanks to Pioneer Woman. I can't wait to make some Christmas cookies with my two taters. Your tribute to your Momma was so sweet and your tears while baking reminded me of one of my favorite books ever, "Like Water for Chocolate" If you aren't familiar with it, I can't recommend it enough. The movie, even though it's subtitled, does a great job of being faitful to the book. Thanks so much for sharing your talents with the world. Merry Christmas! Just finished baking your sugar cookies with my darling daughter and they turned out wonderfully! Thank you for my new favourite [spelled correctly in Canada :) ] sugar cookie recipe!! Loved the tribute to your Mom as well. I can't bake. So I don't. I was nominated to make some sugar cookies for a baby shower, and was terrified I was going to mess them up, so I searched and searched for an easy simple, video-ified, explanation of what the dough needs to look like... this is by far the best recipe! You can't mess it up! I even thought I was using way too much flour, but they turned out great! i found your recipe through Pioneer Woman as well. i have made the dough, but life got interrupted and had to chill it. it's been a few days and now i have the time to do some baking with my little ones. can i still use the dough even though it's been in the fridge for 4 days?? I, too, got your recipe link through The Pioneer Woman Cooks. I notice you use parchment paper to bake; would Silpat work, too? Or is there a difference between using parchment paper vs. Silpat? I found this recipe through the Pioneer Woman. I made them several times in Florida and the dough came out perfectly and the cookies tasted great. Now I"m in NY and the dough is really crumbly and isn't rolling out right. I added some water and they came out great. I'm about to make another batch and I'm going to try it with a little less flour. Maybe the dry air in NY is causing the problem? Your cookies are beautiful! 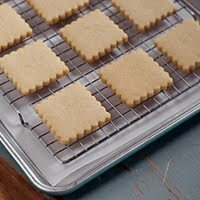 I just made my very first batch of cut-out sugar cookies with this recipe and they are wonderful. Thanks for sharing! Okay I don't even know your mom and now I'm crying. I too lost my mom, two years ago. She also was a wonderful baker and cook. 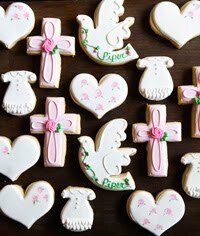 I am going to make these cookies for my daughters birthday and will be thinking of our moms. I hope our children will have found memories of us as we do of our mothers. Live life! Can you please tell me how thick these cookies should be rolled out? In tears... your mom would be so proud of you! Hugs! you should look at kitchengifts.com - they might have a lot of the cutters you would be looking for. Just made these cookies, they turned out great! I feel like the little bit of almond makes this so much more 'adult' than other recipes I've tried. Since the recipe made about 4 dozen for me, I ground up some almonds to put in the last batch, hoping that turns out well. My daughter doesn't want a graduation cake, she'd rather have graduation cookies. Gonna give this a try. Tried this recipe...word for word...and yes it is crumblie, but it never forms...had to throw out 2 batches and ran out of flour...any tips in case I want to use it for another try? I make this recipe at least twice a week...for the past 12 years. I *promise* it works. :) Make sure you are measuring your flour by spooning it into a measuring cup and leveling off with a knife. Possibly you are getting too much. Also, you *will* have to knead it together after that third addition. Ok I emailed you about Communion cookies, couldn't wait even if you responded I'm too impatient. I made these today, wonderful cookie without icing! I made round cookies attempting to make them look like host (hope that's not a sin). I used a icing I had used before with just confectioners sugar, karo, milk and vanilla- tastes like donut glaze. They came out pretty good for my first try! They are tasty, and my son loved them now I have to hope they make it to the Communion! Thank you this is a keeper? i know how it feels to lose a loved one. i have lost so many, it would take me forever to list them all. one thing that i am extreamly greatfull to still have are my parents. i am only 12 yrs old and i love all your cookies! i am a prodogee in baking (as my dad says)and i LOVE your blog! I made this recipe tonight! So delcious!! I will be featuring it on my blog (leaving out the directions so they have to come to your blog) because I think everyone needs to see your blog! Your fabulous! Just made these cookies, they're in the oven and smell delicious! but I didn't use all of the dough, probably only half, how should i store the rest of it? in the freezer or fridge in glad wrap? or do they need to be baked straight away? I too lost my mama to cancer. She loved cardinals and I saw so many of them Christmas day I knew she was there. Thank you for your recipes. 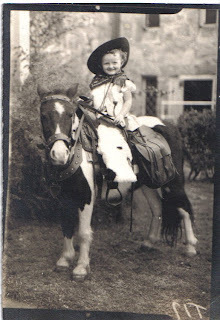 My mom has a picture like that on the horse as well. I love it. Oh my goodness, I just tried these cookies and they are...I mean "amazing" doesn't even describe them! I wrote a post on them, and while my decorating & photography skills still need some work, I'm so happy with the results! Thanks for an excellent recipe! At last you share your recipe thanks dude. How thick do you roll out your dough? Will it rise at all? Reading this was very emotional because I just lost my grandmother. Luckily I still have my parents because I am only 13 years old. My dad may have lung cancer from smoking so I am secretly trying to make him stop, but keep failing. Do you have another yellow LIVESTRONG bracelet? I would like to promote awareness in my baking by bringing foods I bake to school. Please try making a sponge dough bread! It is very soft, fluffy, and easy to make. Please email me at mamorudarien@yahoo.com for information, tips, and recipes. Does it make a difference if bleached flour is used as opposed to unbleached flour? Did I miss where you said how thick to roll the dough? Just wanted to say that this is now the go to recipie for my cookies now. They have been named my 'homemade' cookies as I have a stamp which imprints them with them. They are loved by everyone who eats them. So Major thanks. I am determined (DETERMINED, mind you!) to try my hand at frosted sugar cookies this Christmas. Fingers crossed: I'll try our first batch today in preparation for the feast of St. Nicholas on Tuesday. Thank you, Bridget, for all the recipes, tips, advice, and photos...and thank you for your sense of humor, which made my time over here very pleasant. Blessings to you & your family! This was a lovely post and a beautiful tribute. Bridget, I am getting ready to bake these. I, too, came from PW, but I have to hand it to you. This recipe has me excited! Salted butter! Cold! One egg! Just amazing. Other recipes I've read searching for the one to try my attempt at decorated cookies, call for unsalted butter, softened. I love you for this recipe! I'm hoping mine turn out well, too. Love that you make these often and believe. So sorry about your mom. Love the picture of you two. It is a treasure. Now I need the right tools, the americolors and the meringe powder... I am spanish leaving in Florence, I guess i will have to buy on line. If you have any tips about what to buy and where just tell me. Help is welcome. You are gorgeous! Thanks from Türkiye. I tried this recipe out and loved it! I am going to put it on my blog! These are definitely cute! I love roses and would love some rose cookies for Valentine's day :) So glad I came across this recipe on this list of ideas for yummy goodies to make and send on Valentine's Day. I tried yor recipe and it was a sure hit! I am making 6 dozen cookies for Valentines day this weekend, do you typically double your recipe when making big batches and do single batches? Hiya very nice website!! Guy .. Excellent .. Superb .. I'll bookmark your website and take the feeds additionallyกKI am satisfied to seek out numerous useful information right here within the publish, we need work out extra techniques on this regard, thanks for sharing. . . . . .
We have allergies in the family and i wanted to know if you needed to add the almond extract? I would just use more vanilla or add another flavor of your choice. Thank you for sharing your recipe. Bakes dozens of large cutouts today, and they are just beautiful. I'll be decorating them tomorrow. Just one question. What happens if I don't chill the cutouts before baking? I was afraid of that. The extra step is well worth it though. The cookies came out of my oven with sharp(crisp) cut edges. Can i make the cookies, cut them out, and then store them in the freezer until i am ready to bake? Hello! I love this recipe these are the tastiest cookies i have ever had! I hope you don't mind but i have used your recipe on my blog! Thankyou for sharing this! Can I half this recipe if I don't want to make so many cookies? I am practicing this recipe for my son's Eagle Scout ceremony. I made Fleur-de-lis cookies today with this recipe and 1 hour later they are breaking when I touch them. What did I do wrong? By the way, they taste Awesome. So I watched the video, jotted down the ingredients, and got to work mixing up a batch of cookies. 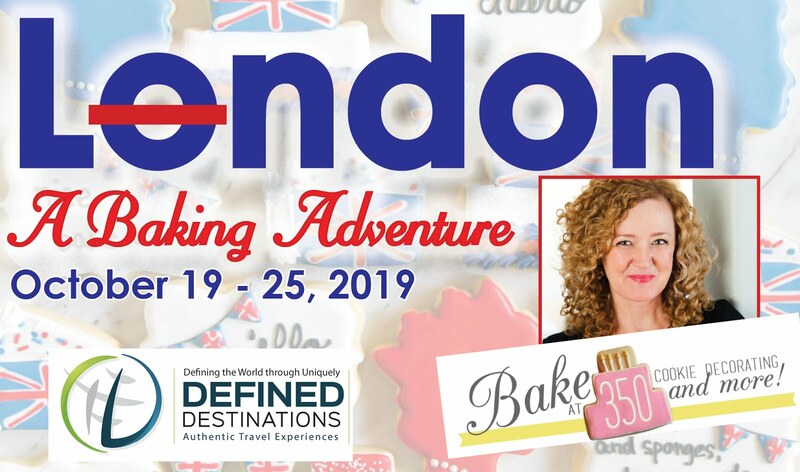 I hadn't written down the temperature for baking...so I actually went back to the blog (as in: typed "bake at 350" into my browser) to look it up. Duh. BTW, the cookies were delish! This looks like a delicious cut out cookie recipe. Some of them are too bland for my likings. Thanks so much for all of the info! I do have a question though... how do you keep the royal icing from getting bubbles in it when you are flooding the cookie? I followed your instructions of letting the icing rest and then stirring after adding the water, but I still got bubbles. Thanks in advance for your help! You'll still have a few bubbles, which you can pop with a toothpick. Be sure to stir gently and never shake the squeeze bottle. Amazing site...I am thinking of starting to bake and this site is soooooo helpful! I WILL buy your book shortly! Can't wait to get started! What an inspiration! These cookies look delicious!! Can I make these without any eggs and using an egg substitute like egg-replacer?? Thanks!! hello! i'm planning to use this recipe to make cookies for my sister's wedding. do you know roughly how many cookies I can get with a 2 1/2" x 2 1/2" star cookie cutter and how many times should I increase the recipe amount? I made this recipe from your cookbook for a school luncheon and a bake sale and the cookies were a huge hit! It was a harvest theme so I made apples and acorns. So cute. I bought your book and am sending one to my sister too. It's fantastic. Best wishes for continued success! I made these cookies for my nephew's 1st birthday party yesterday. The first batch was NOT successful :-(, but it was complete user error! Lol I threw it out and came back to your site, re-read the recipe, watched the video and they came out perfect! The best sugar cookies I've ever made! Held their shape and tasted wonderful! Thank you, thank you for a great recipe and the video tutorial was perfect!! Is this a soft or crisp cookie? Bridget - you're a cookie genius! Lovely. found your blog yesterday looking for cookie recipes and now my husband is wondering why I'm sniffling as I prepare to make cookies with my little boy. 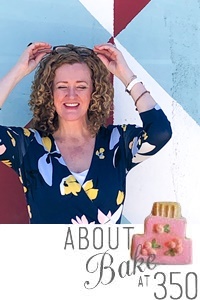 I don't usually comment on blogs but wanted to say thanks for sharing the lovely story to go with these lovely cookies. So pretty, too! Cookies look delish, can you amend recipe to clarify how much a stick of butter is? I'm an American transplant down here to Australia and we don't really do "sticks" of butter. Cup measurements please! I want to make these cookies for my daughter's Birthday. I was wondering could I skip the almond extract and also do I use an extra large egg or large egg? Or it doesn't matter. Can I use regular white granulated sugar instead of using vanilla sugar? Thanks so much. Really, really good cookies. Love the almond extract... having a hard time not eating them all :) I made conversation heart cookies for valentine's day & everyone loved them. Thank you! Question??? :) can i use bleached flour if I don't have unbleached flour? Why or why not? Love, love, love your recipes and cookie book-- I made some adorable bowling cookies for my son's birthday and linked to your recipes today, thanks!! Today I made these cookies for my decorating class next week. I used coconut extract because I didn't have almond. Just got my batch out of the oven. They taste great! The only thing is that they spread. Does anyone have any advice? Thanks and Happy Baking!!! You might want to try eliminating the baking powder. I've done that before and the cookies definitely spread less and the taste and texture of the cookie were not compromised at all! Also, did you put them in the freezer as specified in the recipe? That definitely helps. Do not let them sit on the counter before putting them in the oven. They should go right into the oven from the freezer. I want to make roll out cookies for Easter this year, and I'm excited to try your recipe. Thanks so much! I just made a double batch of your Sugar Cookie recipe. The only change I made was to use all vanilla flavoring. I've tried several different recipes and THIS IS IT! The dough was perfect. Not to dry so it didn't crumble, not too wet so it wasn't sticky. Then I baked for 11 minutes per batch. They were nice and flat, not full of bubbles or lumpy. I waited about 10 minutes. Light, crisp, buttery, DELICIOUS! Thanks for helping me find the perfect sugar cookie recipe! Thank you so much for sharing this recipe. It is the form I have searching for for years. I have tried over a dozen variations and nothing has been right and I hate wasting my time and ingredients. These have flavor, they are soft and hold their shape. I used the freeze-for-a-few-minutes trick and it worked with this dough, though it hasn't with any other sugar cookie I've ever made. I was about to give up last week and only ever use a shortbread type recipe I have. Rolled this one to between 1/4 and 3/8 inch (yes I measured) freeze on tray 5 minutes, in the oven for 11. I live at 4500 ft above sea level. I used up to 2 teaspoons flavoring mixing mostly vanilla with some almond and coconut, I did have an extra large egg. My husband loves it when I decorate cookies with royal icing (I use lemon juice in it), but the cookie has always been lacking so I have rarely done it in our 20 years of marriage. My whole family is going to love our Easter cookies this year and they are definitely worth making now. Hi Bridget Can you freeze this dough? Hi Bridget Can you freeze this dough? Thank you! This is now my go to recipe for sugar cookies! I love the convenience of not having to wait for softened butter. I decorated these with a simple frosting of powdered sugar, corn syrup and milk. I made these to send to my friend's bachelorette party because I could not attend. Unfortunately, they didn't make it to the hotel in time so they were returned in the mail to me two weeks later. I had mailed them in a container wrapped in layers of plastic wrap. I opened it up and two weeks later they STILL tasted amazing! You never would have known that they were two weeks old! I ended up eating the entire package of them over the week. I plan on making them again soon! Thanks! I have some baked ones in my freezer now waiting to be decorated! Has anyone doubled this recipe? I need to make several batches but just wondered if anything different will occur by doubling the ingredients...I know that sounds silly, it should be fine but i just want to be sure before I try it. Thanks! I just came here looking for the same answer. Sometimes the measurements do change for a double batch so I wanted to make sure as well! I absolutely LOVE this recipe! Its so easy and quick and tastes delicious! Thank you for posting your wonderful recipe! I just made a batch and they are delicious. I also tried another recipe from another site and they were good but not as delicious as yours. Thanks for sharing. HI Bridget, I'm from the Philippines and we sometimes get really hot temp. Does this RI recipe melt if exposed to heat even non-direct? I am thinking of making SC with RI for my son's baptism. Thank you for sharing... wonderful to feel this love! And thank you so much for all that you teach us in the kitchen.....!! I enjoyed the tribute to your mother. Aren't the memories of her sweet? I lost my mother a while ago and I know how you feel. I too am a red head and have a blond daughter who is now 43. Your blog is amazing. Thank you for all the tips and wonderful pictures of your work. I have a question about the recipe though: what is a stick of butter? How many grams does this work out to? Hi! I use this recipe allllll the time. I have a question though. Can I freeze the baked cookies for a while before they are iced? Hi Kelsi! It depends on your cutter and how tick you roll the cookies. Think about 12-15 3.5" cookies rolled 1/4" thick. I wouldn't try to double or triple the recipe as it is quite thick. I love these cookies! I have a question though! Can you use a non stand mixer to make the icing? I am a college student and do not have a stand mixer. Thank you! okie dokie... LOVE your recipe. the only question i have is how are you getting them to be so sturdy? maybe i'm not cooking them long enough? i freeze for 5-10 and back for 10-12. they are sturdy enough to decorate yet if I knock them the wrong way while packaging, a piece will usually break (in a soft manner). Too thick you think? This recipe is amazing. I made onesie cookies for a baby shower and used this recipe. I used imitation vanilla and imitation rum flavoring because that's what I had on hand. I figured it wouldn't matter because I hate sugar cookies. (They always taste like baking powder to me and BURN when I cook them!) Not these ones! I did put them in the freezer and pulled them out of the oven before they got brown. I have made 4 batches so far and EVERY time they are so good! 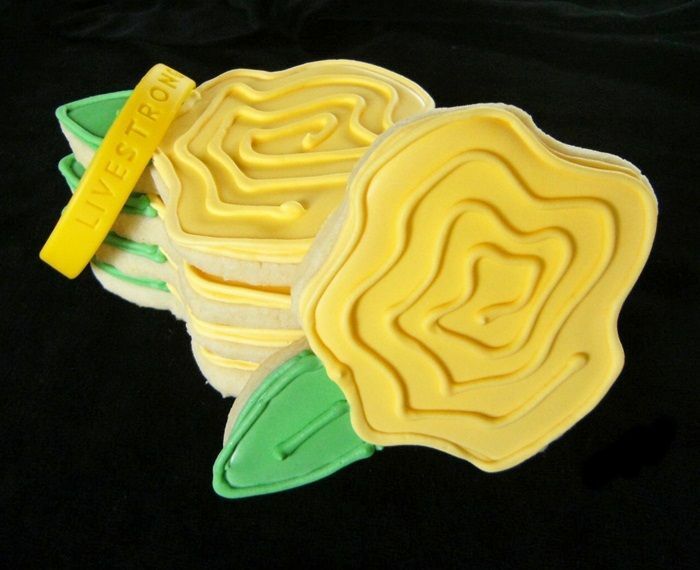 Beautiful yellow cookies, I'm sure its really delicious! Very beautiful cookies. Love to see them. That picture of you and your mother is completely priceless, you look so mischievous! 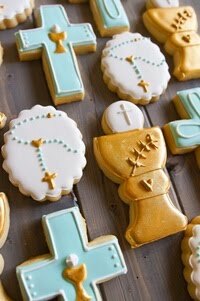 And these cookies look completely divine! Can I freeze the dough if I only want to make half? How long will the cookies last in cookie bags as party favors? So I know how much ahead of time I can make them.